This walk-in closet is bigger than many kitchens. The room is approximately sixteen feet square. 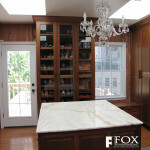 The cabinets and doors are made of sapele plywood and solid sapele, respectively. Fitting the detailed woodwork in the rest of the house, the door panels are raised panels and the top of the cabinets is capped with sapele crown molding. 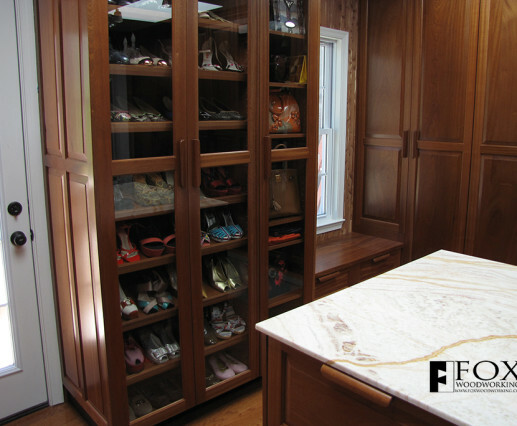 To help this walk-in closet function as an exercise room, the island cabinet is on casters and can be rolled out of the way. 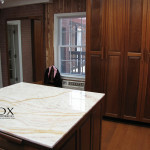 To provide maximum storage space, we even placed four drawers under the window seat. The drawers are solid wood made with dovetails and 1/2" thick plywood bottoms. 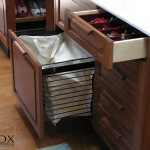 They run on Blum undermount drawer slides with a soft-close feature.